The vulgar dragon? Nah, it's a very special lily we had in our own garden this summer. We bought it last year on a plant fair in Belgium. That leaf and stamen is over 15 inches long! 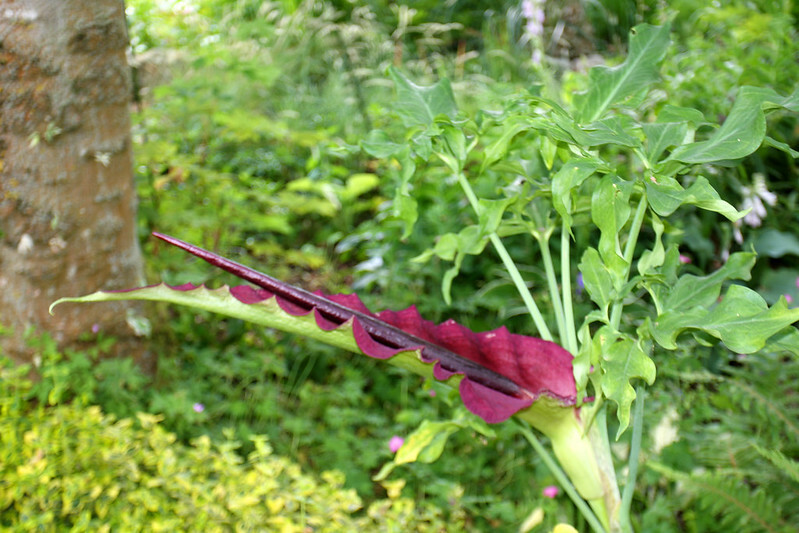 Dracunculus vulgaris is a species of aroid in the genus Dracunculus and is known variously as the Dragon Arum, the Black Arum, the Voodoo Lily, the Snake Lily, the Stink Lily, the Black Dragon, the Black Lily, Dragonwort, and Ragons. In Greece, part of its native range, the plant is called Drakondia, the long spadex being viewed as a small dragon hiding in the spathe. It is native to the Balkans, extending as far as Greece, Crete and the Aegean Islands, and also to the south-western parts of Anatolia. It has been introduced to the United States and is currently present in the states of Oregon, California, Camano Island, Washington and Tennessee as well as the commonwealth of Puerto Rico. The species is characterised by a large purple spathe and spadix has a very unpleasant smell reminiscent of a carcass. That is because the pollinators of this aroid are flies (Lucilia and others). PHEW ...I think I will pass on growing one of these stinky flowers in my garden...and just enjoy the photos you took of Marjon's. It is somewhat attractive, but I don't think I would enjoy any flower that drew in flies...Lord, all the bees I have in my garden are bad enough...but at least they don't stink! ! You know, Maelin, I didn't detect any unpleasant smell and there were no more flies than in other seasons in our garden. So that effect might only occur in its natural (read: warmer) climate or surroundings. The flower doesn't stay in its prime state long, I guess only a week or two, before it starts to deteriorate, sag and whither. Wow, that is quite unusual! Nice find for Marjon's collection.